3. Can we define a method with same name of class? 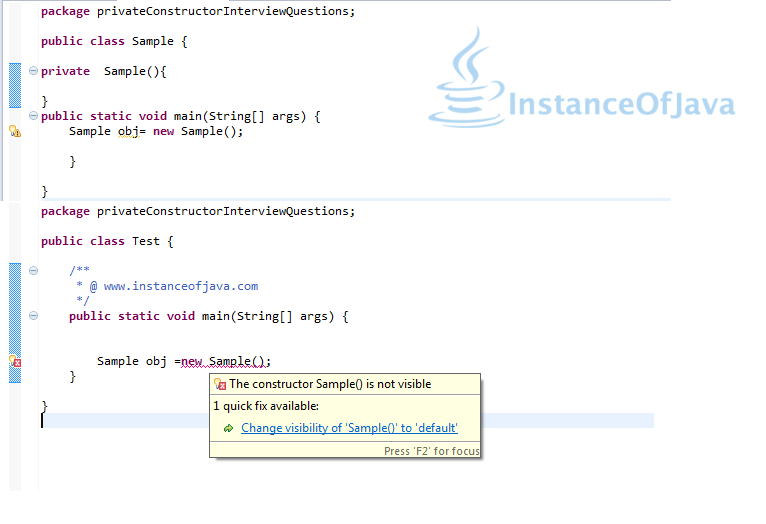 4.If we place return type in constructor prototype will it leads to Error? 5. How compiler and JVM can differentiate constructor and method definitions of both have same class name? 6. How compiler and JVM can differentiate constructor and method invocations of both have same class name? 7.Why return type is not allowed for constructor? 8.Why constructor name is same as class name? 9.Can we declare constructor as private? 10.Is Constructor definition is mandatory in class? 11. Why compiler given constructor is called as default constructor? 12. what is default accessibility modifier of default constructor? 13.When compiler provides default constructor? 14.When developer must provide constructor explicitly? 15.If class has explicit constructor , will it has default constructor? 17.Java Static Constructor : is it possible to create static constructor?